It was just a couple short months ago that I was last in Portland checking out spots such as Migration, Coalition, and Burnside. But, I’m pretty sure you can’t make too many trips to Portland to drink beer, so a couple weekends ago it was back on the train and down to PDX for another weekend of beer (and food) exploration. The first part of the trip found me in the Mt. Tabor neighborhood, which is an easy bus ride from downtown on the #20 or #15. My first stop might have been my favorite of the weekend, and a place I’ll be tempted to go back to on any future trip. 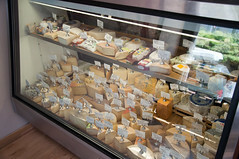 Cheese Bar sits on a quiet stretch of Belmont with no other retail shops around it, but it is well-worth finding your way over there. While the focus is on their amazing selections of cheeses and meats, they also offer five or six tap beers and an impressive list of bottles (Oakshire Hellshire, anyone?). I shared a meat board, cheese board, and fish board with a couple of friends for lunch, as well as a cup of the ridiculously good smoked tomato & spring onion gazpacho. The lunch was impressive and was the perfect snacking food to go along with my pint of Burnside Sweet Heat, which I sampled for the first time on my previous trip and fell in love with (Please, someone in Seattle copy this beer). They had all Oregon beer on tap for Oregon Beer Month, including a special barrel-aged beer from Oakshire made with dates and a cask of 4.3% ABV Bonfire English Mild from Hopworks. Cheese Bar is the perfect neighborhood spot to grab a light lunch and a beer on the weekend or just to pick something special up to bring home for dinner. I’m jealous of anyone that gets to live close to this place. It was time to walk off some of that cheese, so I took the fairly steep hike up to the top of Mt. Tabor Park to enjoy the weather and check out the view. Even on a Friday around noon, the park was buzzing with people out and about enjoying themselves, and I’d bet this is a pretty popular spot on summer weekends. After some exploration, reading and relaxing in the park, I walked down the other side and over to Roscoe’s. I honestly haven’t heard much about this place in all of the time I’ve spent in PDX, and I’m not really sure why. It is a ways outside of the core of the city, but an impressive tap list and slightly divey feel made me feel right at home bellying up and talking to a couple regulars. I sipped a glass of the 10% ABV Boneyard Armored Fist, which was a collaboration brew done with my hometown brewery, Three Floyd’s of Munster, IN. I’m still not that familiar with Boneyard, but I know from experience that 3F are masters of the hop, and this big, dark, hoppy brew did not disappoint. According to Brewpublic, Boneyard brewer Anthony Lawrence has (or had?) a working relationship of some sort with 3F and “if things go as planned, Lawrence and company will start distributing the highly regarded Midwestern beers in Oregon.” I hope to see that come true, but it sure would be an impressive feat considering 3F had to pull back distribution a couple of years ago and can hardly keep up with demand closer to home. One high octane beer was plenty for me at Roscoe’s, so I hopped on the #15 back towards downtown. Before I knew it though, the bus was passing the Horse Brass and I couldn’t just keep going and not stop for a beer. So, on a bright, sunny day I stepped into the darkness of the Horse Brass (R.I.P. Don Younger) and found something that always makes me smile: Russian River Blind Pig IPA on tap. It was tempting to stay for another pint, but I had to get back downtown to meet up with the Beer Retard at Bailey’s. Bailey’s always does an outstanding job of rotating Oregon breweries through their taps, and I’d estimate that on any given visit typically 50% to 75% of the beers on tap I’ve never tried, or even heard of. This time their list featured four beers that weighed in at 3.6% ABV or less, making them quite attractive with a long night ahead. I had a light saison from the cask that was 3.5% ABV I think (don’t recall what it was), and then tried a Little Dog from one of my favorite Portland breweries, Hair of the Dog. It turned out to be one of the few misses I encountered over the weekend. Little Dog was made from the second runnings of one of HOTD’s standard beers; I’m not sure which was the base beer for this one, but it didn’t work out well. The Beer Retard & I were both excited about grabbing some good eats while in town, and we headed over to Olympic Provisions just on the SE side of the river. 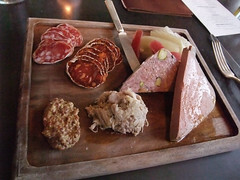 We sampled a selection of their charcuterie that did not disappoint and washed it down with a pint of the solid Everybody’s Brewing Local Lager, from White Salmon, WA. 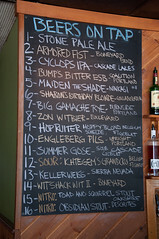 That was the only beer on tap, but we also spied cans of Caldera IPA, which is never a bad option. It was a quick walk from there over to what should be a must-hit for any sour beer freak visiting PDX: Cascade Barrel House. We sampled several things, including their “straight-from-the -barrel” offerings, which were Bing Cherry and Noyeaux Quad (drool…). We were tempted to go upscale and get some cocktails at the nearby Beaker & Flask, but we walked over to Burnside Brewing to meet up with Ezra from The New School fame. In addition to another glass of the Sweet Heat, I tasted the Berliner-Weisse and Alter Ego Double IPA for the first time; both were impressive. But, the highlight was a taste of their upcoming Gratzer from the tanks that brewer Jason McAdam threw our way. This old Polish style features smoked wheat malt that I think Jason said they hand-smoked in their kitchen. I thought it was a fantastic balance of a clean, unfiltered, light ABV ale with plenty of smoke flavor coming through. One of my favorite session beers is the Aecht Schlenkerla Helles, which carries just a bit of smoke flavor from using the same tanks & kettles as the brewery’s uber-smokey Rauchbier. Burnside’s version of the gratzer reminds me of that beer, but with more smoke flavor. Love it. Jason said he plans for it to be out for OBF this upcoming weekend, and that it should be on tap at the brewery for some time after that. Also of note at Burnside was their burger, which we grabbed off the late night food menu. Very solid burger cooked in duck fat. Can’t say much for the limp fries that came with it, though. I’ve been impressed with the limited amount of food I’ve tried off their menu so far (house-made sausages last time), and I’m looking forward to more in the future. We finished the night off at a divey place across the street with a perfect pint of Hopworks Pale that I probably didn’t need, but really enjoyed. All-in-all, I’d say that was one hell of day. And, this was only Day 1 of the trip. Look for the rest of the report soon.